If using dried beans, soak them overnight in cold water and cook according to package. Usually this means 3 Cups of water per Cup of beans and boiling them for 90 minutes or so until tender. I think dried beans have better texture, but you can definitely use canned as well. Just drain and rinse them before making the dish. In a heavy cast iron skillet or dutch oven, add bacon over medium low heat and cook until bacon renders out most of the fat but doesn't get very crispy, about 10-15 minutes. Remove bacon and set aside for later. Chop onions, green peppers, and chipotle peppers (optional, but delicious). Add onions, and green peppers to bacon grease. If it is really dry, add a drizzle of oil to the pan. Cook over medium-high heat until veggies are soft. Add tomatoes, chipotle peppers, adobo sauce, and cooked beans. Stir well to combine. Add Porter, molasses and brown sugar next. Bring to a simmer and stir frequently until sugar is dissolved. It will look pretty liquidy, but that's okay. Simmer this on the stove top until the mixture thickens, probably about 30-45 minutes. Add a big pinch of salt and pepper and taste for flavors. Remove from the heat and add strips of bacon from before on top of the beans. Bake bean mixture in a 375°F oven until thick and bubbly and bacon is very crispy, about 45 minutes. This time may vary depending on how much liquid is in your dish. Let cool for a few minutes and serve immediately. This keeps perfectly ine fridge for a week or so as well. After I made this dish for the first time, I filed it away in my "Save a Friend" folder. If you ever have someone who's had a rough day or is just a bit down on their luck (and it can be YOURSELF), then this is the recipe for that situation. It's rich, hearty, comforting, and cooking it is a slow process without being a lot of work. You have to give time for the beans to bake so there's no rushing this dish--and that's a good thing. Plus, why would you want to rush it? It requires two delicious Porter beers and that means that there are most likely four other beers sitting in your fridge - feeling left out and abused. So invite a friend over, share a beer, and try this out. Here is the full Beer and Bacon Baked Bean Recipe. You're going to want some good bacon for this dish. The thicker the better, in my opinion. It also helps to have a nice big cast iron skillet or Dutch oven that you can move from the stove to the oven. If you don't have that though, you can do the first part of the dish in a normal pot and then pour everything into a baking dish. Start by slicing your bacon into large chunks and add them to your pan over medium-low heat. The low heat will let the fat slowly render out of the bacon without crisping it up too much. Cook this for 15 minutes or so and then remove the bacon and add your diced onions and peppers to the bacon grease. If the pan is dry, add a drizzle of oil. Turn up the heat to medium-high and cook the veggies until they are soft, about 5 minutes. Meanwhile, get your beans ready. 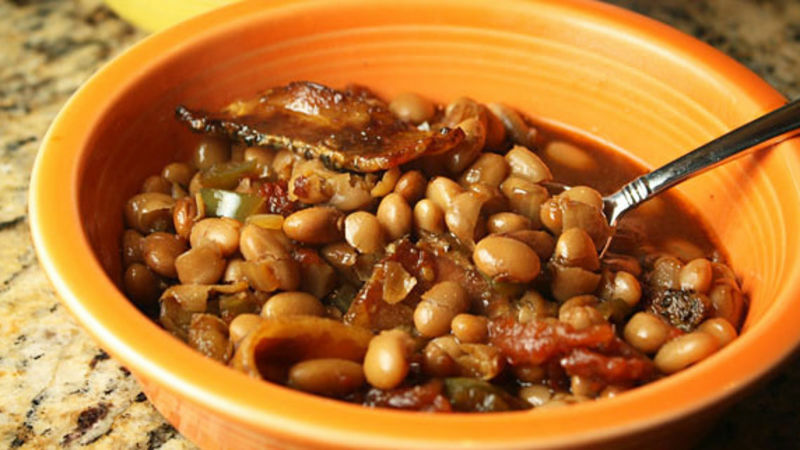 I really like using dried beans for this dish because they can absorb a bit more liquid and just generally have a better texture, but you can use canned pinto beans. Just drain and rinse them before you add them to the dish. Once your veggies have softened a bit, add the canned tomatoes (if you have whole tomatoes, mush them up with your hands), the chipotle peppers, and all the beans to the pot. Stir this all together and then pour in your beer. I highly recommend a good Porter for this. The sweetness and darkness of the beer goes great with the brown sugar bacon. Add the beer in along with the brown sugar, molasses, and a good pinch of salt and pepper. Bring this to a simmer over medium heat and simmer, stirring occasionally, for 30-45 minutes until the dish thickens a bit. Again, this isn't a dish you make quickly on a weeknight. It's the definition of slow, comfort food. When the mixture has thickened a bit, take it off the heat and add the cooked, but limp, strips of bacon to the top of the dish. Cook this bad boy at 350 degrees for 45 minutes to an hour. It's pretty hard to over-cook this, honestly. It only gets better the thicker it gets. Just check it every once in awhile to make sure it isn't burning. When it's done, the sauce will be nice and thick and the bacon extra crispy on top. On a cold Fall day, not much beats this dish. Leftovers keep perfectly in the fridge for a week or so. Nick is drinking four leftover beers this week while he blogs at Macheesmo. Check out his Tablespoon profile to find out more about him!